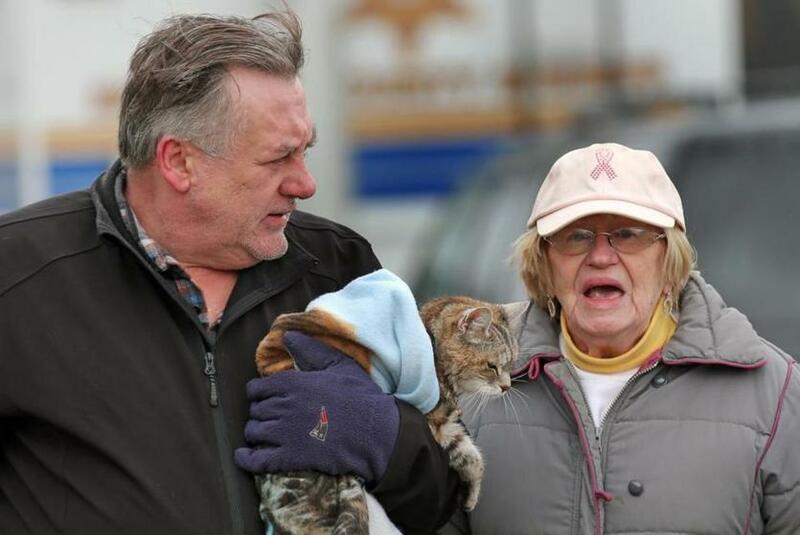 "Mittens" was bundled and carried by Mitchell Wojtasinski, son in law to Mary Johnson, as they departed their storm-damaged home in Quincy. 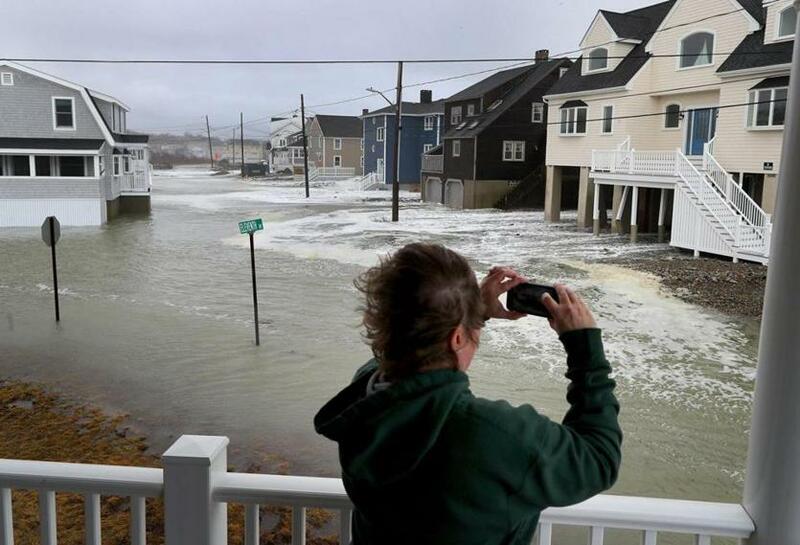 Sue Parmer took photos of the rising surf on Oceanside Drive at high tide in Scituate on Saturday. 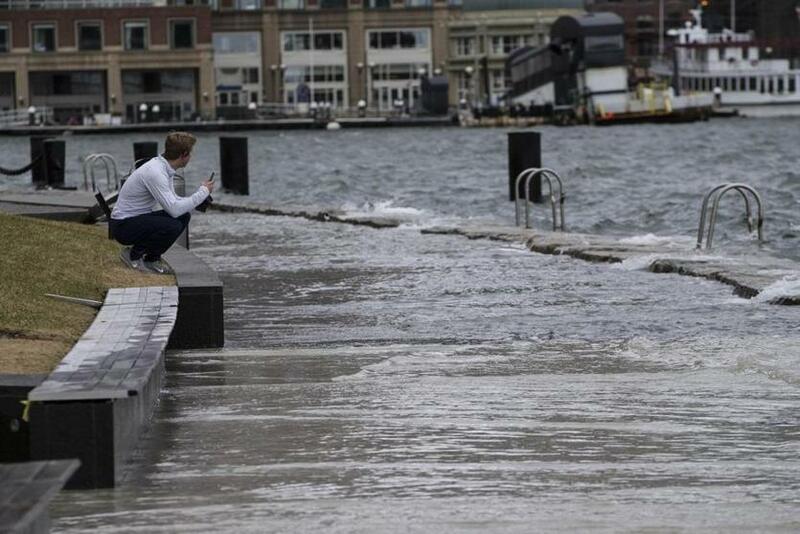 A man watched as waves flooded into Fan Pier in the Seaport District in Boston. Jacob Gurner walked through a flooded backyard after checking on his home on Otis Road in Scituate. 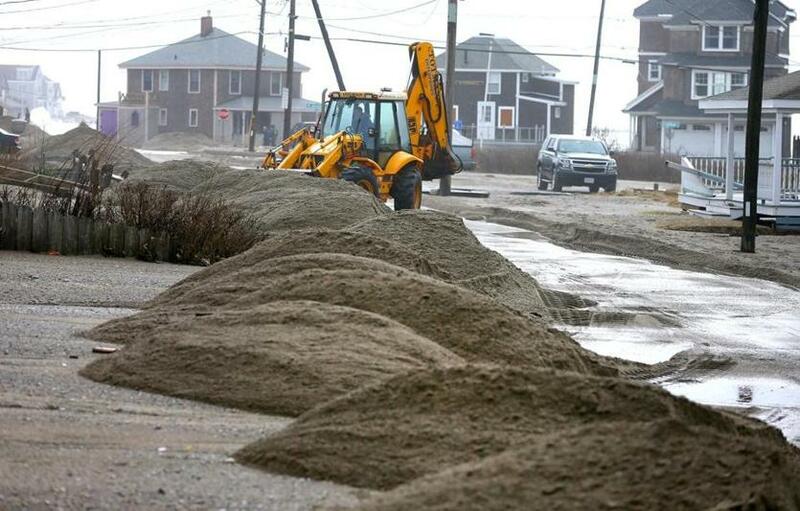 A front-end loader cleared sand from Turner Road in Scituate on Saturday morning. 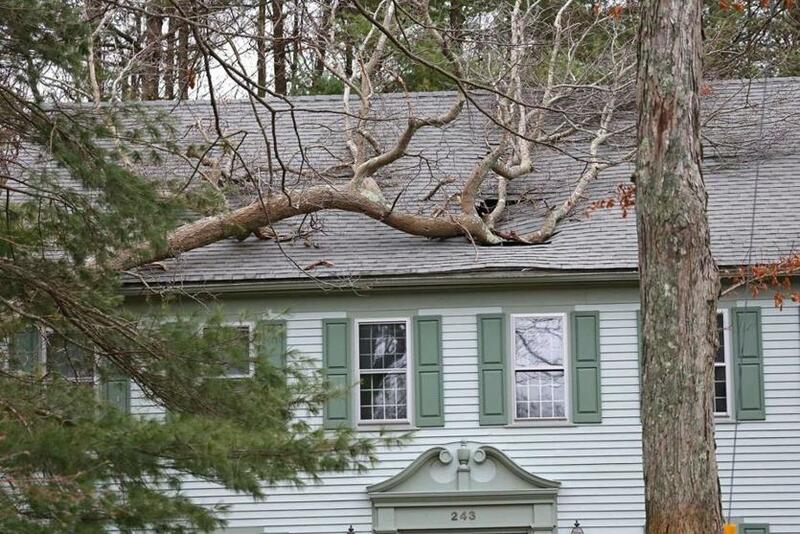 A tree landed on a house on Larchmont Lane in Hanover. 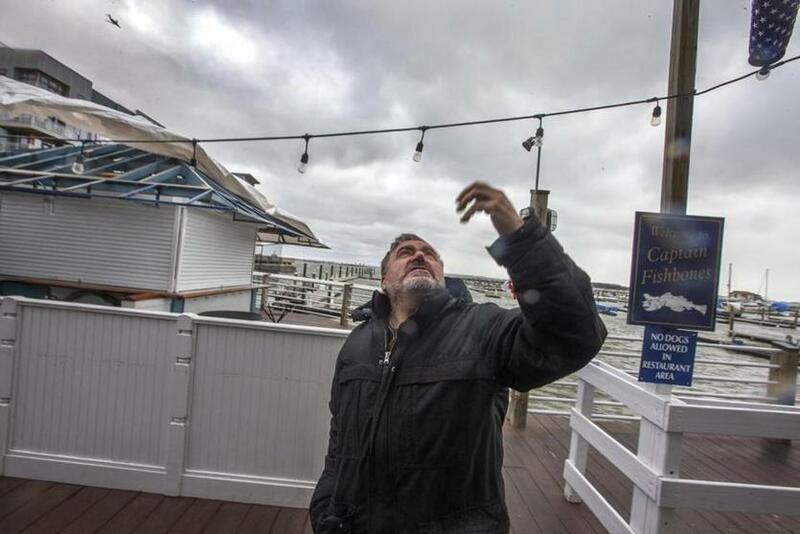 Donato Frattaroli, owner of Captain Fishbones in Marina Bay in Quincy, cleaned up after storm. 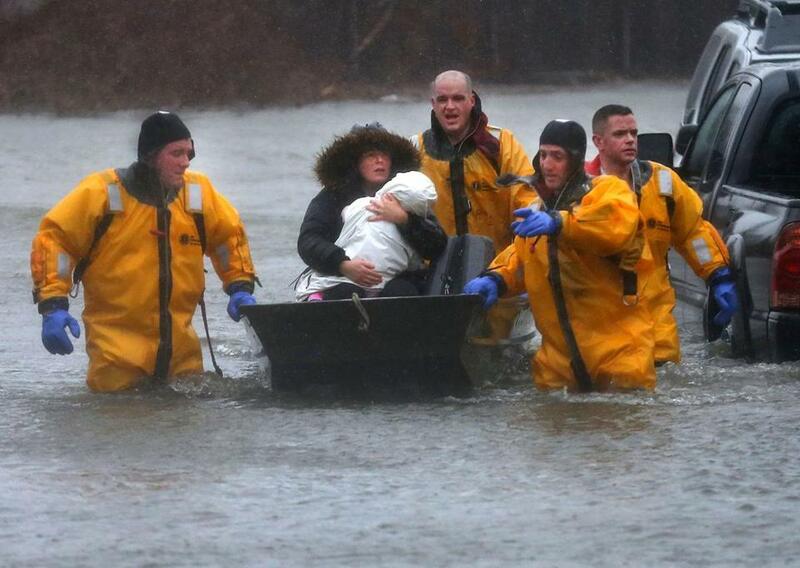 A mother and child were rescued by a boat from their home in Quincy. Firefighter Jack Bulman of the Scituate Fire Department looks over a flooded Jericho Road. 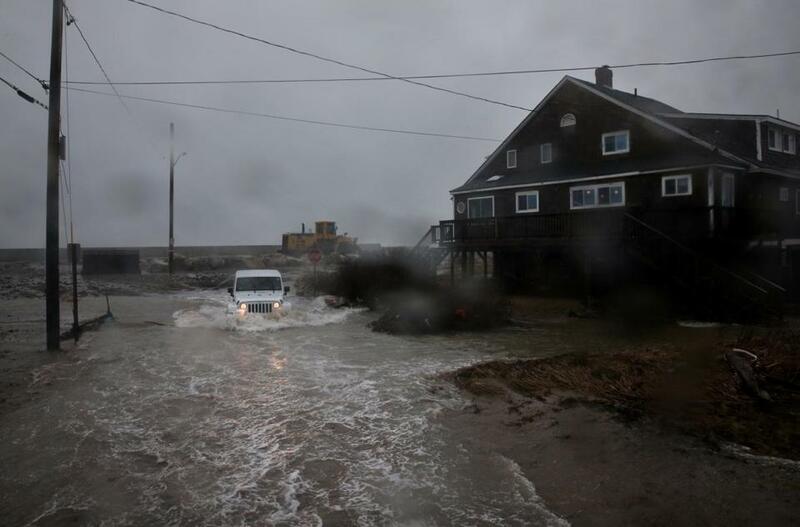 Oceanside Drive resident Kate McRoberts passed through a flooded Kenneth Rd in Scituate on Friday. 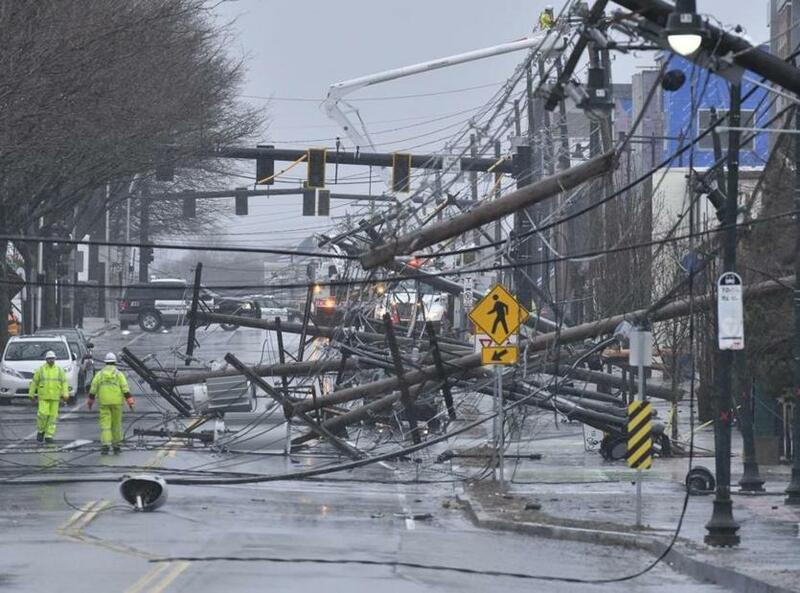 Utility poles and power lines fell on Arsenal Street in Watertown. 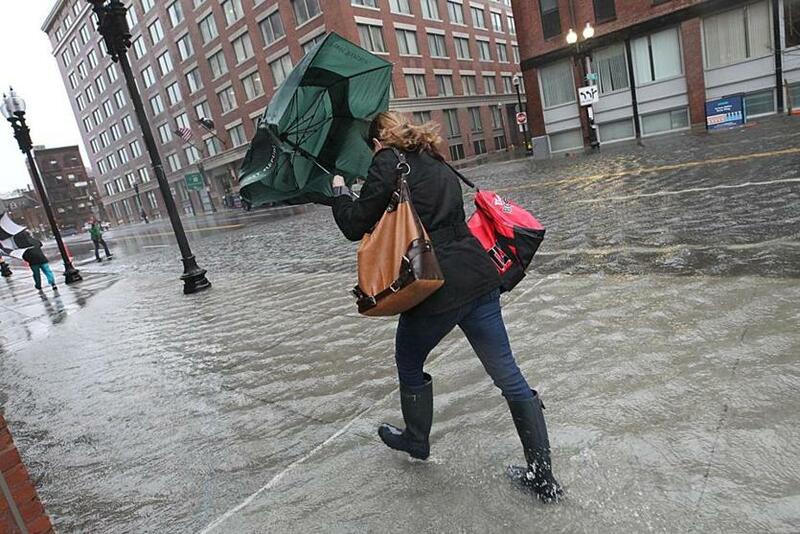 A pedestrian struggled to walk through the water on Causeway Street. 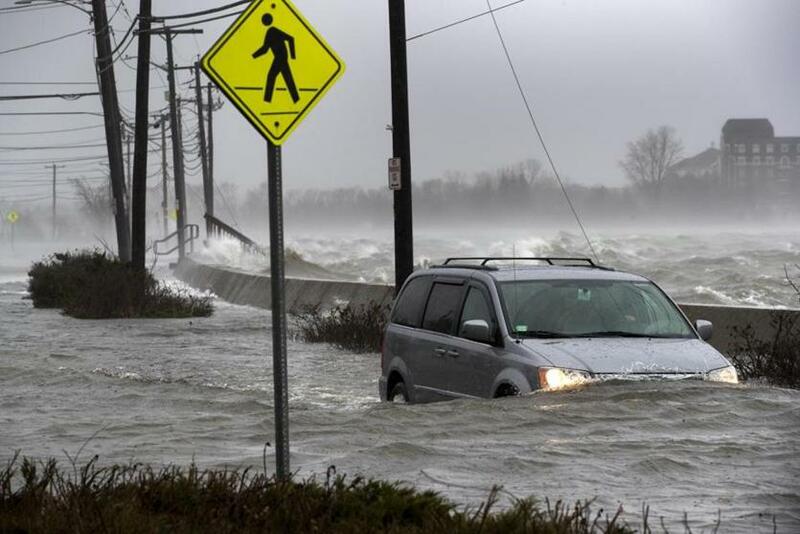 Flooding along East Squantum Street in Quincy. 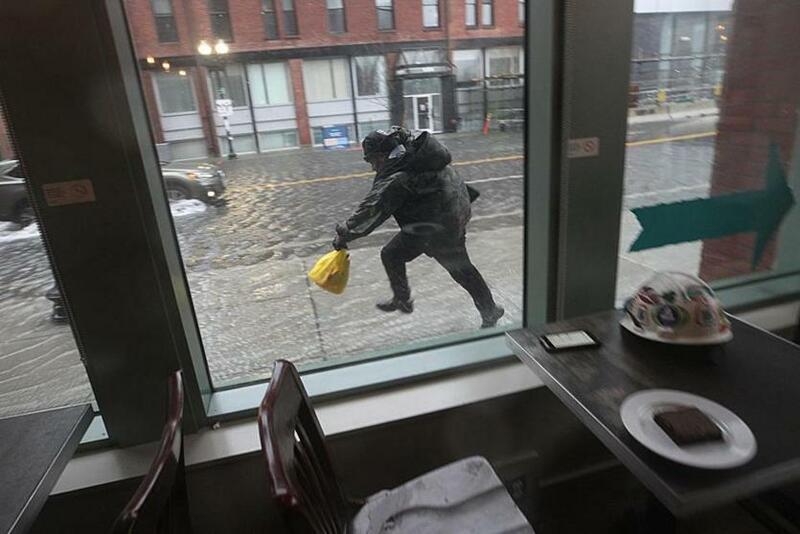 A person dashed through the rising water as seen from inside a dry coffee shop. 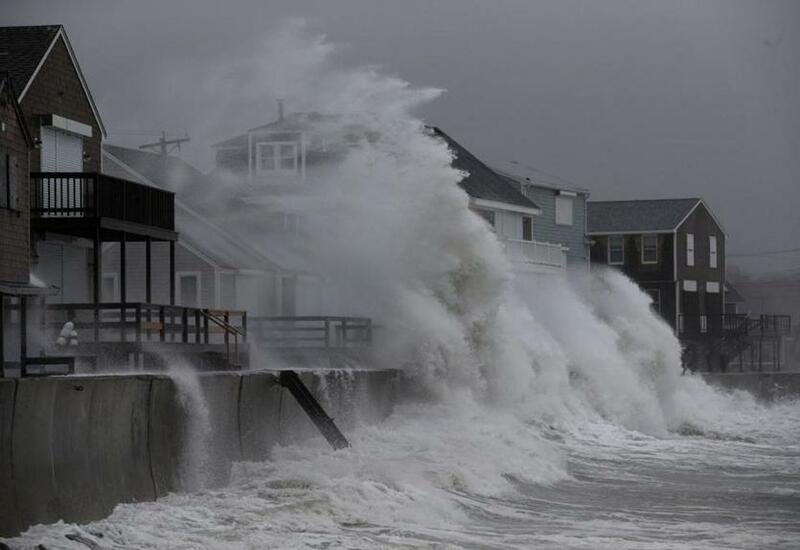 Waves crashed against the seawall along Turner Road in Scituate. 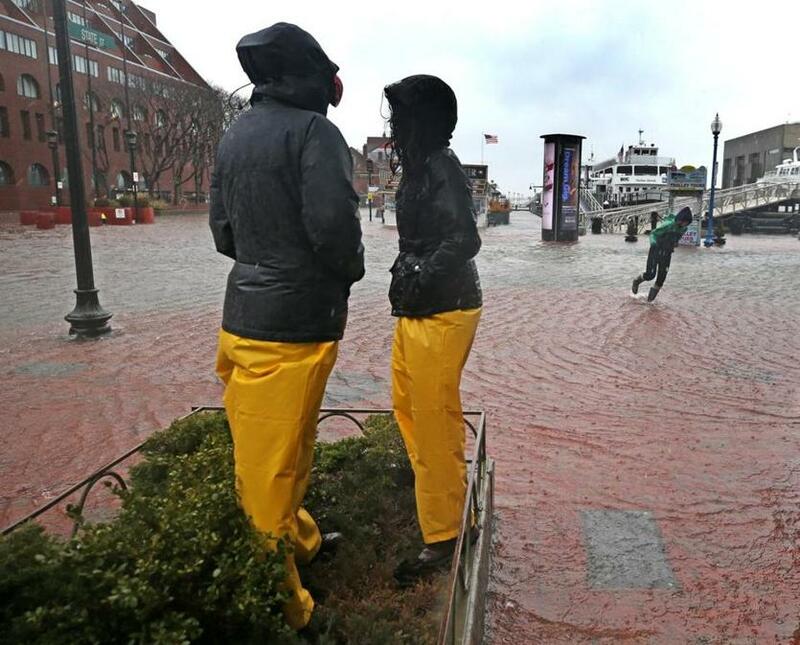 A couple kept high and dry by standing on top of a garden planter on State Street. 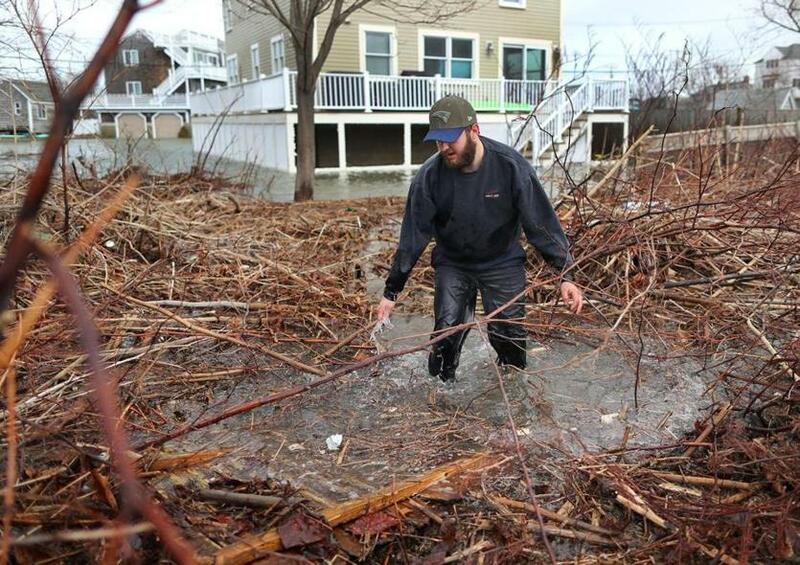 Daniel Cunningham dodged waves on E. Squantum Street in Quincy. 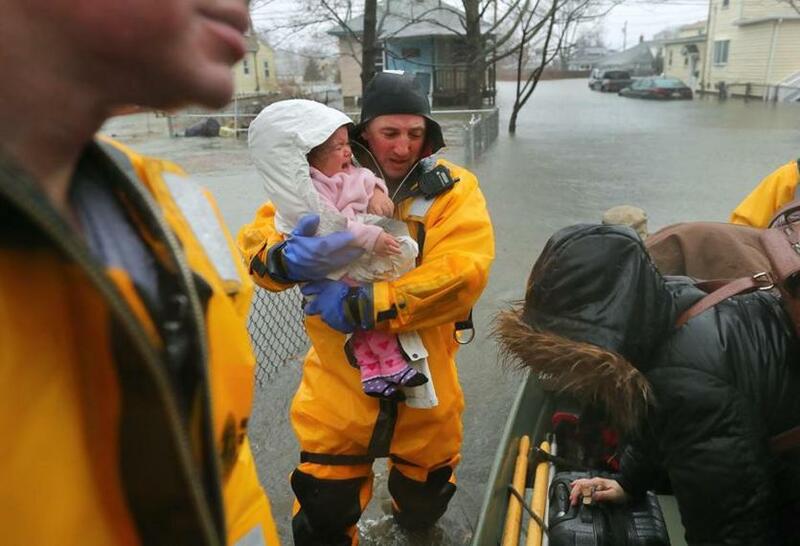 A rescue worker held a crying baby rescued with her mother from a flooded home on Post Island Road in Quincy. 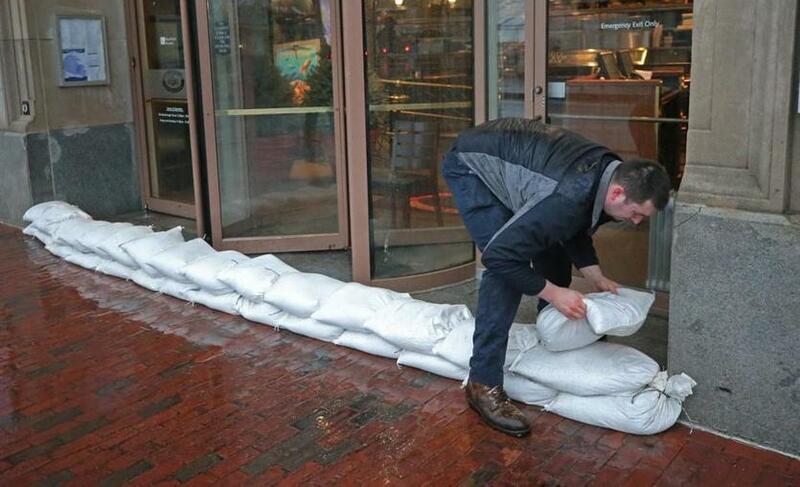 Ryan Adams placed sandbags at the entrance of 255 State St. in Boston. 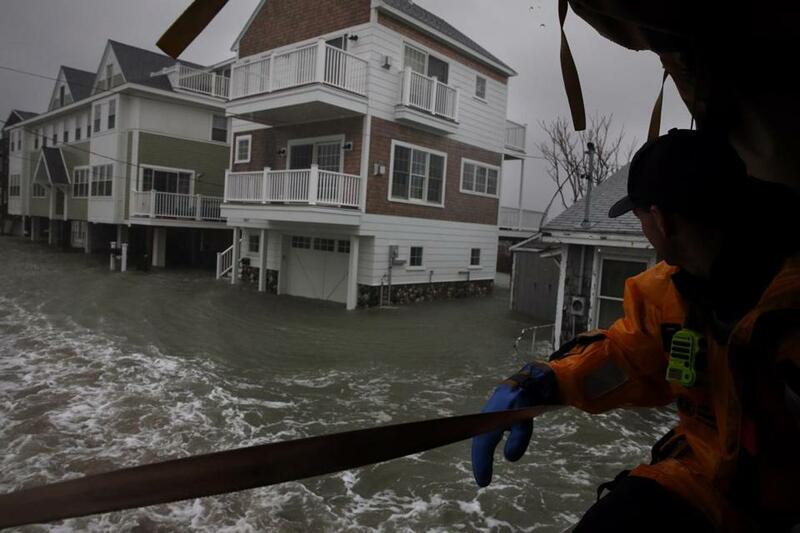 Waves crashed onto a house along Turner Road in Scituate.